Relatives leading the 46th Bloody Sunday anniversary march and rally. The 47th Bloody Sunday march will be launched in Guildhall Square on Tuesday with the focus squarely on the military top brass responsible for an operation that led to the slaughter of 13 innocent civilians on January 30, 1972. The Bloody Sunday March Committee has urged all those opposed to ‘State murder’ to gather at Shipquay Place at 1 p.m. on December 4 in solidarity with the families of those killed by the British Army’s Parachute Regiment while taking part in a peaceful anti-internment march in 1972. The committee believes the ‘British establishment’ has been happy to pursue a course of action in which the footsoldiers of the Parachute Regiment’s 1st Battalion who fired the bullets on Bloody Sunday may be the only ones ever held to account for the atrocity. In a statement issued to the ‘Journal’ in advance of the official launch of the 2019 commemorations, the committee said: “Next January’s 47th annual Bloody Sunday march will call for responsibility for the killings to be laid at the door not only of those who pulled the triggers but of those who ordered that the triggers be pulled. Eight years ago Mark Saville in his report on Bloody Sunday was unable to express a view on whether or not a “culture of impunity” existed among British soldiers in Ireland at the time. The Bloody Sunday March Committee, however, believes such a ‘culture’ did exist. 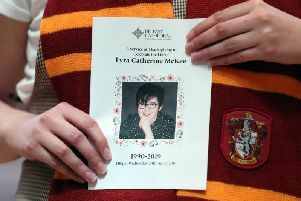 “We invite anyone who wants to stand up against State murder to join with us next Tuesday, December 4 at 1 p.m. at the Guildhall Square,” it said.